In an application filed recently by a ‘resident taxpayer’ (which was a subsidiary company in India) for seeking an advance ruling, the income tax (I-T) department has contested that tax residents of India are not eligible for this option. However, the department has approached the Central Board of Direct Taxes (CBDT), seeking a clarification. The reason for such a stand by the tax department is a change in numbering of the relevant section of the I-T Act, by the Finance Act, 2017. Yet another challenge from the I-T department is that the applicant seeking an advance ruling can do so only for a single transaction and not multiple transactions. 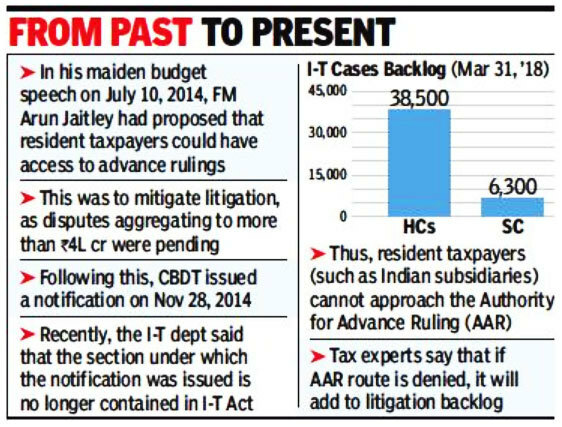 Given that the objective of the government was to mitigate tax litigation, this spanner in the works has shocked I-T professionals and corporates. Under the I-T Act, subsidiaries of MNCs operating in India are resident taxpayers as these companies are registered here. Overseas entities set up by India-headquartered companies could be considered as resident taxpayers if their place of effective management (where key decisions are made) is in India. The Authority for Advance Ruling (AAR), a quasi-judicial body, provides for an alternate dispute-resolution mechanism for both direct and indirect taxes. It enables the applicant to obtain certainty on tax implications of transactions, including proposed transactions. For example, in an M&A transaction, the tax liability for the seller can be ascertained through an advance ruling. As the ruling given is binding on both the taxpayer and the tax department, in respect of the transaction covered, it results in certainty and avoids litigation at a later stage. “If the advance ruling mechanism is not available to resident taxpayers, it will shake confidence. It will also add to the litigation backlog,” says a chartered accountant. A senior official of the I-T department had some days ago written to the CBDT, seeking a clarification on whether resident taxpayers should continue to be allowed to apply for advance rulings. TOI has a copy of this letter. The I-T department is waiting for a clarification, until which time it is likely that applications filed by resident taxpayers will continue to be challenged. To cut down on litigation, the doors of the AAR were thrown open to tax residents of India since late 2014. A notification issued by the CBDT on November 28, 2014, expanded the definition of the applicant seeking a ruling. It now included: “A tax resident of India, in relation to his tax liability arising out of one or more transactions valuing Rs 100 crore or more in total.” Since then, several subsidiaries have benefited. Given the high threshold, it was unlikely that resident individuals could opt for this mechanism. The letter dated March 31 addressed to the CBDT by the senior I-T official points out that this notification is no longer applicable. After an amendment by the Finance Act, 2017, section 245N(b)(iia) under which it was issued no longer exists in the I-T Act. Tax experts point out that a similar section 245N(b)(A)(III) was introduced. “The current government, in its first year, had opened the doors of advance ruling forum to residents. While the threshold was kept high at Rs 100 crore, this recent stand of the I-T department is likely to impact cases for all resident applicants. This also goes against the intent of making this amendment in law to reduce litigation and improve ease of doing business,” says KPMG India partner Naveen Aggarwal. “Can a mere change in the number pattern really nullify a provision, which was introduced with a certain intent and objective?”Incidentally, the 2019 tutorial on filing of AAR applications on the website of the I-T department refers to the CBDT’s notification and the fact that tax residents of India can approach the AAR for one or more transactions.